The American statesman William Henry Seward was born on the 16th of May 1801 in the village of Florida, Orange county, New York. He graduated from Union College in 1820, having taught school for a short time at Savannah, Georgia, to help pay his expenses; was admitted to the bar at Utica, NY, in 1822, and in the following year began the practice of law at Auburn, NY, which was his home for the rest of his life. He soon attained distinction in his profession, but drifted into politics, for which he had a greater liking, and early became associated with Thurlow Weed. He was at first an adherent of Daniel D. Tompkins in state, and a National Republican in national politics, after 1828 became allied with the Anti-Masonic party, attending the national conventions of 1830 and 1831, and as a member of the organization he served four years (1830-1834) in the state Senate. By 1833 the Anti-Masonic movement had run its course, and Seward allied himself with the other opponents of the Jackson Democrats, becoming a Whig. In 1834 he received the Whig nomination for governor, but was defeated by William L. Marcy. Four years later he was re-nominated, was elected, was re-elected in 1840, and served from January 1839 until January 1843. 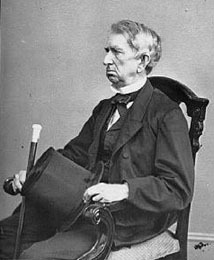 As governor, Seward favored a continuance of works of internal improvement at public expense, although this policy had already plunged the state into financial embarrassment. His administration was disturbed by the anti-rent agitation and by the McLeod incident growing out of the Canadian rebellion of 1837. During this period he attracted much attention by his liberal and humane policy, promoting prison reform, and proposing to admit Roman Catholic and foreign teachers into the public schools of the state. His refusal soon after his inauguration to honor the requisition of the governor of Virginia for three persons charged with assisting a slave to escape from Norfolk, provoked retaliatory measures by the Virginia legislature, in which Mississippi and South Carolina soon joined. Laws were also passed during his term putting obstacles in the way of recovering fugitive slaves. Seward soon became recognized as the leader of the anti-slavery Whigs. He was one of the earliest political opponents of slavery, as distinguished from the radical Abolitionists, or the followers of William Lloyd Garrison, who eschewed politics and devoted themselves to a moral agitation. On retiring from office Seward returned to the practice of law. His reputation was made in four great criminal cases -- those of Abel F. Fitch and others, of Freeman, of Wyatt and of Van Zandt -- the last-named bringing him especially the goodwill of opponents of slavery. Toward the end of his career at the bar, however, he changed from a general practitioner to a patent lawyer, and as such had a lucrative practice. When the Whigs secured a momentary control of the state legislature in 1849 they sent Seward to the United States Senate. The antagonism between free labor and slave labor became the theme of many of his speeches. In his first set speech in the Senate, on the 11th of March 1850, in opposing the pending compromise measures, he attracted the attention of the whole country by his assertion that "there is a higher law than the Constitution" regulating "our authority over the domain" (i.e. the Territories.) When the Democrats, however, declared such language incendiary he tried to explain it away, and by so doing offended his friends without appeasing his opponents. In a speech at Rochester, New York, in 1858 he made the famous statement that there was "an irrepressible conflict between opposing and enduring forces, and it means that the United States must and will, sooner or later, become either entirely a slave-holding nation or entirely a free-labor nation." Although this idea had often been expressed by others, and by Seward himself in his speech of 1848, yet he was severely criticized, and four days later he sought to render this statement innocuous also. In the election of 1852 Seward supported General Winfield Scott, but not his party platform, because it declared the Compromise of 1850 a finality. He naturally opposed the Kansas-Nebraska Bill of 1854, which repealed the Missouri Compromise and established the principle of popular sovereignty in the Territories. Subsequently he actively supported in the Senate the free-state cause in Kansas. In 1854-1855, when it became evident that the Whig party in the North was moribund, Seward helped to lead its scattered remnants into the Republican fold. As the recognized leader of the new party, his nomination by the Republicans for the presidency in 1856 and in 1860 was regarded as certain; but in each instance he was put aside for another. The heterogeneous elements of the new organization could not be made to unite on a man who for so many years had devoted his energies to purely Whig measures, and he was considered less "available" than John C. Fremont in 1856 and than Abraham Lincoln in 1860. After Lincoln was elected in 1860 he chose Seward for his Secretary of State. The new President was a man comparatively little known outside the state of Illinois, and many of his supporters, doubtful of his ability to deal with the difficult problems of 1861, looked to Seward as the most experienced man of the administration and the one who should direct its policy. Seward himself, apparently sharing these views, although not out of vanity, at first possessed an unbounded confidence in his ability to influence the President and his cabinet. He believed that the Union could be saved without a war, and that a policy of delay would prevent the secession of the border states, which in turn would gradually coax their more southern neighbors back into their proper relations with the Federal government. In informal conferences with commissioners from the seceded states he assured them that Fort Sumter should be speedily evacuated. Finding himself overruled by the war party in the cabinet, on the 1st of April 1861, Seward suggested a war of all America against most of Europe, with himself as the director of the enterprise. The conduct of Spain toward Santo Domingo and of France toward Mexico, and the alleged attitude of England and Russia toward the seceded states were to be the grounds for precipitating this gigantic conflict; and agents were to be sent into Canada, Mexico and Central America to arouse a spirit of hostility to European intervention. Dangers from abroad would destroy the centrifugal forces at home, and the Union would be saved. When this hare-brained proposal was quietly put aside by the President, and Seward perceived in Lincoln a Chief Executive in fact as well as in name, he dropped into his proper place, and as Secretary of State rendered services of inestimable value to the nation. To prevent foreign states from giving official recognition to the Confederacy was the task of the hour, and in this he was successful. While he did not succeed in preventing the French occupation of Mexico or the escape of the Confederate cruiser "Alabama" from England, his diplomacy prepared the way for a future adjustment satisfactory to the United States of the difficulties with these powers. While his treaty with Lord Lyons in 1862 for the suppression of the slave trade conceded to England the right of search to a limited extent in African and Cuban waters, he secured a similar concession for American war vessels from the British government, and by his course in the Trent Affair he virtually committed Great Britain to the American attitude with regard to this right. On the 5th of April 1865 Seward was thrown from his carriage and severely injured. Nine days later, while lying ill at his home at Washington DC, he was attacked by one Lewis Powell, alias Payne, a fellow-conspirator of John Wilkes Booth, at the same time that Lincoln was assassinated. The secretary's son, Frederick W. Seward, and three other persons who came to his assistance, were also wounded by the assailant. Seward's wife, an invalid, received such a shock that she died within two months, and his only daughter, who witnessed the assault, never recovered from the effects of the scene and died within the year. Seward gradually regained his health, and remained in the cabinet of President Andrew Johnson until the expiration of his term in 1869. In the struggle between the Executive and Congress over the method of reconstructing the Southern States, Seward sided with Johnson and thus shared some of the obloquy bestowed upon that unfortunate President. His greatest work in this period was the purchase of Alaska from Russia, deemed "Seward's Folly" by his detractors, in 1867. He also negotiated treaties for the purchase of the Danish West Indies, the Bay of Samana, and for American control of the Isthmus of Panama; but these were not ratified by the Senate. After returning to private life, Seward spent two years and a half in travel and died at Auburn on the 10th of October 1872. His son, Frederick William Seward, was born in Auburn, NY, on the 8th of July 1830, graduated at Union College in 1849 and was admitted to the bar at Rochester, NY, in 1851. From 1851 to 1861 he was one of the editors and owners of the Albany Evening Journal, and during his father's term at the head of the State Department he was Assistant Secretary of State. He served in the New York Assembly in 1875, and from 1877 to 1881 was again Assistant Secretary of State. After 1881 he devoted his time to the practice of his profession and to lecturing and writing. Whig until 1855, when he joined the Republican Party.